A lot of 4WD’s run viscous fan hubs. Over time, they deteriorate and eventually stop working. This means your engine has very little air being sucked through via the main cooling fan and as a result it can overheat. The viscous fan hub is one of the most commonly overlooked components on a 4WD, and whats worse is it plays one of the most critical roles. It’s a recipe for total disaster; when did you last check yours? What does a Viscous fan hub do? Some 4WD’s have electric fans, or fans that are positive drive. However, most run a viscous fan hub, which is a mechanical arrangement that drives your cooling fan faster or slower depending on the engine temperature. Fluid inside of the coupling heats up as the engine temperature rises, causing the fan hub to grip more, and engage the fan. 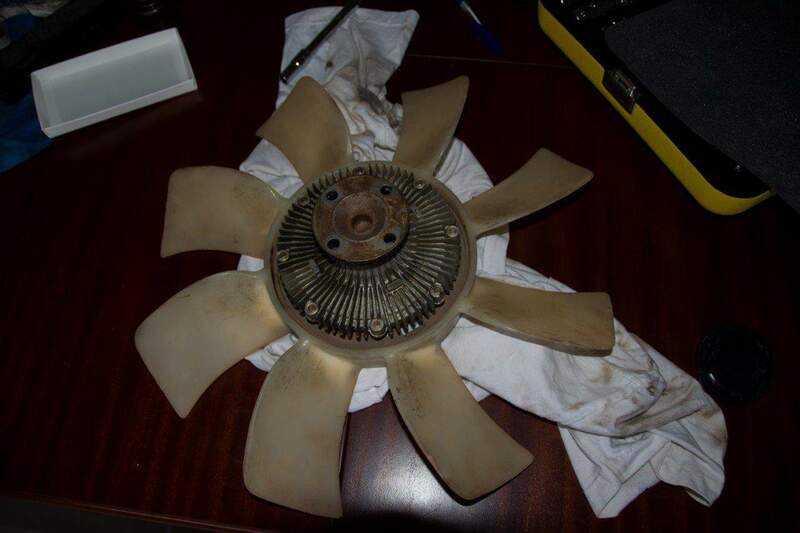 Under correct operation when the engine is cold, the fan will spin but not very hard. As it warms up, the fan will kick in to keep the engine cool. 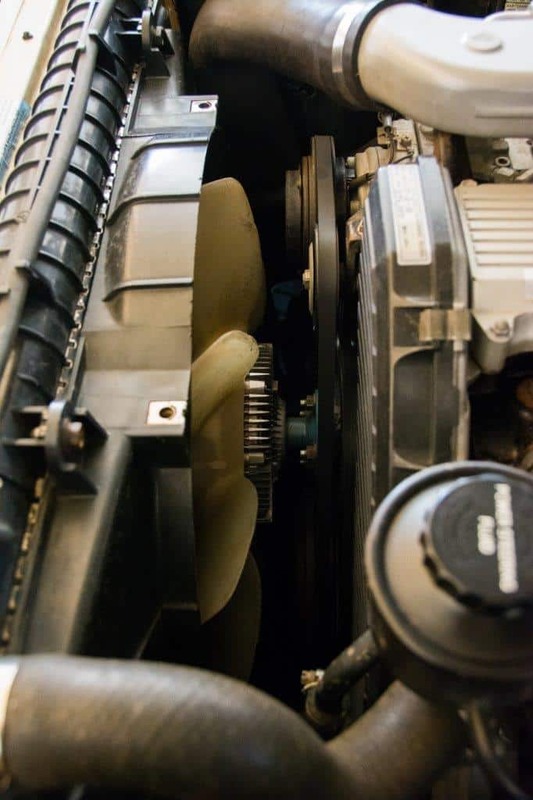 If it gets really warm, you should hear the fan roar loudly to bring the engine temperature back down. Without a properly functioning viscous fan hub, your engine can easily overheat, which often causes extremely expensive repairs. 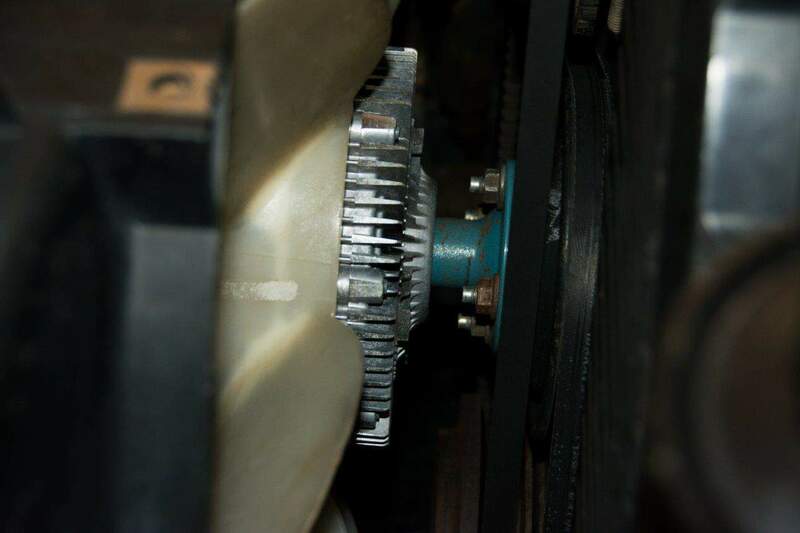 When you are driving at high speeds it is less important, but when you slow down (off road, traffic lights or low speed suburb work) you are at risk of your engine getting too hot without a working viscous fan hub. How do you know if its working properly? When your motor is hot, you should be able to hear the fan kick in. If you can’t, pop the bonnet, and turn the vehicle off while watching the fan. If it comes to a fairly abrupt stop, the fan hub is working properly. If it keeps spinning round and round, your fan hub is knackered and needs to be repaired or replaced. Another way is to have the engine off after a decent drive, and flick the fan around by hand. If it stops quickly, you are good to go. If it doesn’t, you’ve got a problem. You’ve probably noticed that a lot of factory temperature gauges rise to their normal point (around half way), and you never see them move from there. Toyota’s in particular, have about a 20 degree band where the engine temperature can go up and down (as it naturally does depending on the circumstances) before you’ll see their gauge move. Once you see the temperature gauge moving, you’ve got issues, and its often too late notice. The work around is to install an aftermarket temperature gauge, like an engine watchdog, or a coolant temperature gauge. Many modern vehicles already have this information displayed via the computer, and you just need the OBD connections to gain access to it. Just know that even if your factory temperature gauge is reading within the right limits, it may actually not be! I first found out about the viscous hubs importance not long after heading down to Bremer Bay for Christmas one year with our 80 Series Land Cruiser. 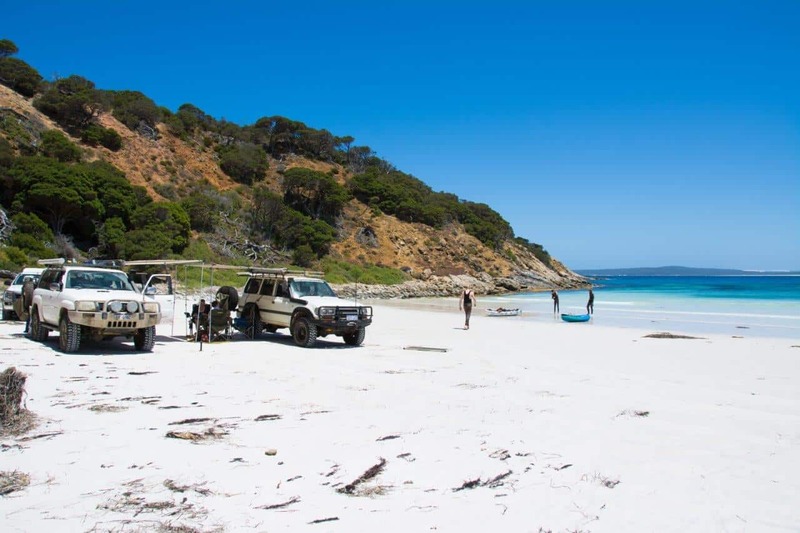 We travelled from 3AM in Perth and arrived at Bremer Bay in the morning, pulling straight onto the beach to deflate the tyres down. When I got back in the vehicle (which was left idling), I noticed the temperature gauge had moved up from its normal halfway mark. Whilst travelling at high speeds enough airflow was making its way through the engine bay, but pull up and leave it idle and the engine would get warm. The issue actually turned out to be a minor blown head gasket, with coolant slowly being shifted into the overflow bottle at high RPM and not being sucked back in, but the engine was able to get warmer because the viscous fan hub wasn’t working properly. Not long ago I was inspecting an 80 Series Land Cruiser for the owner, and had a peak under the engine bay. We’d just stopped after driving on soft sand for about an hour, and I gave the fan a flick. To my surprise, it kept spinning around and around for some time, before coming to a halt. I mentioned it to the owner, who told me it had just been serviced and checked by a reputable workshop in Perth. This story is not uncommon; the viscous hub is one of the most overlooked components in a 4WD. Unfortunately for those who don’t know this, it can be the cause of an overheated engine, and they then have to pay to have it fixed. I’m not exactly sure as to why this gets overlooked by so many people, and even qualified mechanics. I’d hazard a guess that the work is done on a 4WD primarily when its cold, and you can’t tell very easily then whether it works or not. It literally takes 20 seconds to diagnose, but you need to do it when the engine is hot. Some viscous hubs can be opened and serviced, as well as adjusted. On the 80 series Land Cruiser, some of the hubs allow you to adjust what temperature it kicks in and out, and you can vary the amount of oil inside, which also does the same thing. You can buy the silicon oil from most auto shops (Toyota sell it too). Toyota use 10000 grade CST in the 80 series. If you really want, you can get it from hobby shops, with different grade CST (or viscosity). I removed my viscous hub and attempted to repair it by replacing the fluid, but it still wouldn’t engage properly, so I ditched it. Viscous hubs can be purchased from a variety of aftermarket manufacturers, for anywhere from $80 – $250. Seeing as how important of a role it plays, I opted to go for a genuine one. I’d read of too many aftermarket ones giving issues. Toyota in Perth offered me trade price at a whopping $580. Instead, I went to Amayama.com, and purchased a genuine one for about $350 delivered to my door in around a week. Just the other day I was looking at a Brunswick 6.5 litre chevy engine (that had a failed water pump), and noticed the viscous hub had been removed and replaced with a solid machined block. What this does is run the fan at maximum speed all the time. Apparently this is a common modification that Brunswick Diesels do, to combat the many overheating issues they have. It is an option, but in my opinion a terrible one. For starters, a viscous hub is intended to regulate the engine temperature by changing the fan speed. If you lock it in all the time, even when the engine is cold its still trying to cool it as much as possible. You want your engine to warm up quickly, and locking the hub reduces this. From there, you can argue that it saps a fair bit of extra power from the motor (and probably fuel too), is louder and vibrates more than necessary. Perhaps the most important thing though, is that it reduces reliability, especially if the fan runs off the same shaft as your water pump does. The GU patrol mentioned above had a failed water pump, because one of the bearings had let go and flogged it out. When we reinstalled everything, it was obvious upon watching the fan that it moves up and down, and in and out. A car cooling fan is never going to be perfectly balanced, and by not having a viscous hub in place you pass all of the imperfection in vibrations onto a couple of little bearings. It was lucky this failed just out of Perth, as it could have happened at Steep Point, or across at Dirk Hartog Island. Replacing a water pump in one of these is not a minor task! My advice then, is make sure your viscous hub works properly, and don’t remove it! Take a moment to walk out to your 4WD, and see if the hub is working properly. It might save you some major repairs! Good to hear you sorted your overheating issues. It can be a right pain in the backside chasing issues like that.